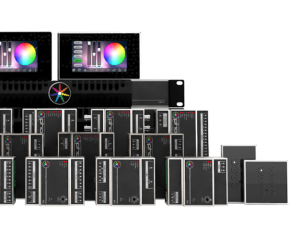 The right equipment for every installation, with impressive scalability. Whether it’s one controller or many, it’s all easily programmed via our Designer 2 software. Multiple Pharos products can be connected via Ethernet to increase the channels controlled and the number of communication ports in your project. Pharos systems are built to suit the individual needs of the project ­– they consist of one or more controllers and optional remote devices and wall stations. All products work together in tandem, communicating over industry standard Ethernet networks. Programming is done in a single Designer 2 project file, making it easy to build and program a system perfectly tailored to your needs. Pharos controllers range from a single universe (512 channels) of control, all the way to a whopping 3000 universes (over 1.5 million channels). Multiple controllers can be used together in a single system and will work together seamlessly. Find out which controller is right for your project! 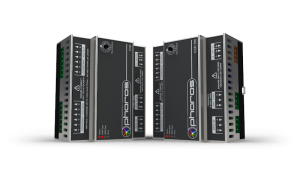 Pharos remote devices add extra interfaces to your Pharos system. 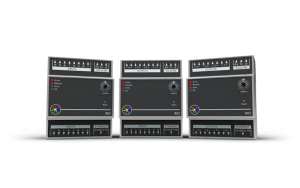 Choose from extra digital/analogue inputs, relay outputs, DALI buses or timecode/audio inputs. These extra ports function just like those on the controller itself, with their behaviour determined by our Pharos Trigger engine. 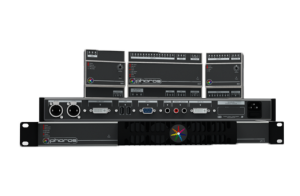 Pharos wall stations, including the Touch Panel Station(TPS) and Button Panel Station(BPS), add human interfaces to your Pharos system. 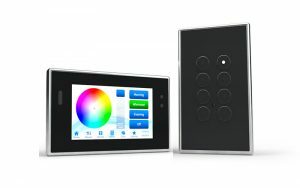 The touch interface can be completely customised with the required controls and styling. Like remote devices, the behaviour of both TPS and BPS can be determined using our Pharos Trigger engine. Sometimes the exact system is being installed in multiple different locations – perhaps different shops in a retail chain or the same ride in multiple different theme parks around the world. Maintaining different project files for each installation can be time-consuming and error-prone, with changes needing to be applied separately to each file. But no longer! With the unique Pharos feature of Install Replications, you can upload the same project to up to 100 different sets of installed hardware, making it easy to maintain projects that are repeated in many locations. Sometimes one system isn’t enough. Maybe you are lighting an entire campus, or the facades of an entire city. You want to commission and program the lighting system for each building independently, but have all buildings work together to create one mega installation. That’s where Pharos Director comes in. Director facilitates the mapping of video content and scheduling of events across multiple Pharos installations, all from a single PC or Mac. Define multiple panorama to control how content maps across the pixel arrays in each system, and then use convenient calendar-based scheduling to determine when video clips, timelines, and triggers should be activated across all installations. A manual override interface is also available for when you want a human in control.